Callahan Golf Links in Waleska possesses a rich history of more than 150 years of farming and family ownership. Before being converted into a golf course, the site functioned as a farm from the Civil War until World War II. The 18-hole Cobblestone Golf Course in Acworth, Georgia is a public golf course that opened in 1993. Designed by Baxter Spann, Joe Finger and Ken Dye, Cobblestone Golf Course measures 6759 yards from the longest tees and has a slope rating of 139 and a 73. The 18-hole Woodland Hills Golf Club in Cartersville, Georgia is a semi-private golf course that opened in 1978. Designed by David Bingman, Woodland Hills Golf Club measures 6420 yards from the longest tees and has a slope rating of 124 and a 70 USGA rating. Collins Hills Golf Club is a little known course to outsiders, but it is a local favorite. The traditional parkland layout tumbles across a rolling terrain. The golf course features small, undulating greens and narrows fairways bordered by towering trees. The 18-hole Legacy Golf Links in Smyrna, Georgia is a public golf course that opened in 1994. Designed by Larry Nelson, Legacy Golf Links measures 2954 yards from the longest tees and has a slope rating of 86 and a 55.6 USGA rating. The course features 3 sets of tees for different skill levels. The 18-hole Fox Creek Golf Club in Smyrna, Georgia is a public golf course that opened in 1985. Designed by John LaFoy, Fox Creek Golf Club measures 3879 yards from the longest tees and has a slope rating of 104 and a 59. 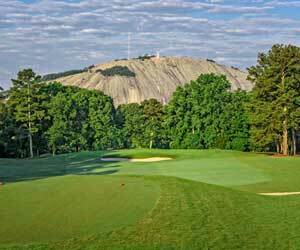 Stone Mountain Golf Club sits at the base of one of the Southeast's most popular attractions, Stone Mountain. The club offers two 18-hole courses, Lakemont and Stonemont. The Stonemont Course is the club's original layout, designed by Robert Trent Jones. Atlanta has established itself as the capital of the South and has taken the lead in the region when it comes to a diverse variety of topics from civil rights to finance to construction to entertainment -- and golf. With its abundance of meeting spaces, hotels and the busiest (and very efficient) airport in the world, Atlanta has become a popular gathering spot. In 1996 the city hosted the Centennial Olympic Games. Atlanta is home to professional franchises in each major sport: the NFL Falcons, the MLB Braves, the NHL Thrashers and the NBA Hawks. The Braves won the World Series in 1995, the city's only major championship. Atlanta is home to the legendary Bobby Jones, considered by some the greatest golfer ever. He grew up playing at Atlanta's East Lake Golf Club, which now hosts the PGA Tour's annual PGA Tour's Tour Championship, a limited field event that determines the winner of the FedExCup. Jones also helped establish the Atlanta Athletic Club in Duluth, which has hosted the U.S. Open, the U.S. Women's Open and the PGA Championship. At one time there were few venues available for public golfers. Rapid growth in the region led to over-development of golf courses, which are now readily available in almost all quandrants of the city. Atlanta's public courses stay busy, but are usually in above-average condition, with Alfred "Tup" Holmes Golf Club and North Fulton Golf Course at the top of the list. Another popular destination is Stone Mountain, which features two golf courses that surround the world's largest piece of exposed granite. Non-golfing family members will enjoy the attractions such as a treetop zipline, a skyride to the top of the mountain, a scenic train ride and a laser light display that's shown on the side of the mountain each evening in the spring and summer. The golf is very good, too. The difficult Stonemont course at Stone Mountain G.C. was designed by Robert Trent Jones and isn't for the faint of heart, while the John LaFoy-designed Lakemont course incorporates more water into play and may be more appropriate for the occasional golfer. Golf in Atlanta is nearly a year-round activity. There are normally a few weeks in January or February each year where temperatures drop low enough to keep away the hardiest players. Snow is infrequent and what little occurs doesn't usually linger very long. And when golf isn't in the forecast, there are a million things to do. From the Six Flags amusement park to the hugely popular Georgia Aquarium, the largest in the nation, visitors can always find ways to occupy their time in Atlanta. Since taking over ownership of Eagle's Brooke Country Club in January 2013, the Schwendinger Group has been busy putting the golf course through a rapid cosmetic makeover. And the firm's work is getting noticed. Eagle's Brooke is rated among the top courses south of Atlanta on GolfNow.com. It appears as if Eagle's Brooke is set to realize its enormous potential. Before players strike a shot at Crystal Falls Golf Club they are treated to idyllic views of the Blue Ridge Mountains, as they approach the clubhouse and as they contemplate the tee shot on the panoramic first hole. Despite its remote mountain location in Dawsonville, Ga., 65 miles north of Atlanta, players are finding their way to Crystal Falls. Opened in 1997, Oak Mountain Championship Golf Club remains something of an undiscovered gem because of its remote location on a mountaintop in Carrollton, an hour west of Atlanta. Ward Northrup built a muscular golf course which measures between 5,187 and 7,056 yards from five sets of tees. With a prime-time rate of $55, it's worth the extra drive time. Like most large metropolitan area, it's not easy to get from one side of Atlanta to the other. Fortunately for golfers, there are good golf courses in each of Atlanta's major quadrants. You don't have to travel from one side of town to the other to find a good course. It's possible to stay in your own neck of the woods and still find a facility that will be challenging and enjoyable.